A simple delid tool that i made for chopping Intel 115x CPU. !!!! !You may Try out the Kaby-LAKE Delid tool as Skylake CPUs should also work with it !!!!! A simple tool to remove the Heatspreader of your Skylake CPU. * put some sort of rubber or foam on the inner bottom of the base. * put the CPU into the CPU-holder with the long PCB part looking over the end of the tray. * then put it in your vice and close it carefully. For enough strengh print at least with 3 perimeters and 30% infill ! A vice. - do NOT use a screw clamp ! 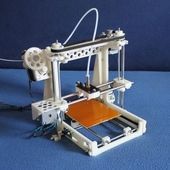 a 3D printer that can print very exact, the dimensions are very tight to ensure that the cpu won`t jump out while pressing. ´For optimal results print with 0,1mm layerheight or less and use PLA with high infill. It worked great on i5 4670. Reduced -10C average. @ Fabio, sorry, Skylake-X has Socket 2066, so it does not fit, Socket 1155 is smaller. It works with Skylake-x processor is 7820X !? Sorry for my english Im French ! Ok thx, I printed (4h print, 80% infil cubic subdivision, layer 0.1mm and approximately 60mm per second) that this morning and i test this afternoon. Il keep you informed ! Yes, but it we do 105% on X scale and 101% in Y, Z scale for operating clearance. But, if it's very tight fit, we can enlarge model with a dilation ? Actually it should work, its just a tight fit and i dont want to ruin my cpu. The shape of the heatspreaders ist slightly different. Why does not work with 8700K ? It's the same PCB no ? Does NOTwork With i7 8700k. Anyone successfully used with coffee lake cpu? 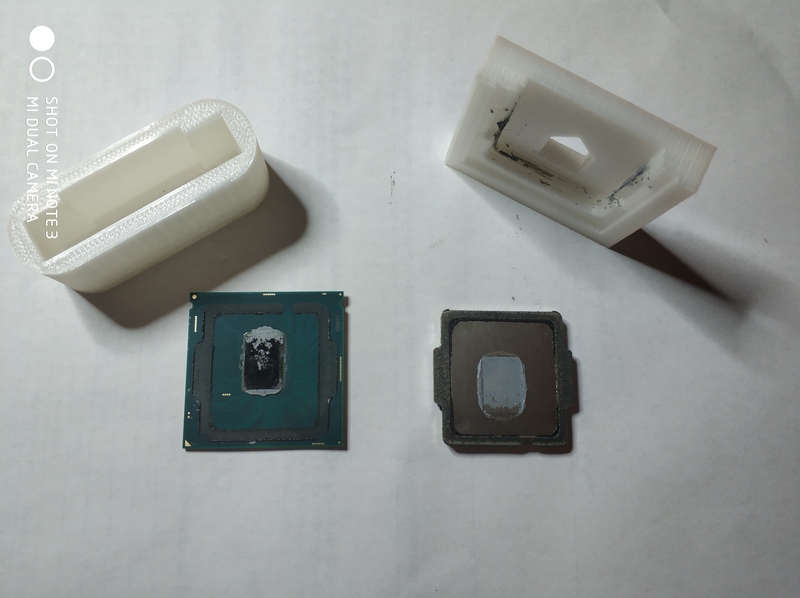 Test fitted my i7-8700K and it didnt go flush (too wide ihs). But those two cutoffs didnt grab ihs, feels like it might hold still enough but didnt test it. @ Nima R , yes as i also did a delid on a 4790k which is also a haswell. Would this work for the i7 4770k? no it doesn't the ivy bridge heatspreader is different. doesn't fit. shouldnt be hard to adjust the raw STL file for someone who knows how to do that. hopefully someone will do that. Hehe, as long as its good quality, for what i`ve seen that italy seller is printing bad quality, so not recommended from my side. Hey Chri thanks for the really big help. an additional $8 will be added to the cost of 30% infill and with 3 perimeters. so that will be around $21. il post pictures the soonest it arrives. again thanks alot. its a big help. now i dont have to order it in ITALY. hahaha. Everyone defines "standard quality" different, you have to look at their other parts how the quality is. Hey thanks for the reply. I recently inquired with a 3D shop printing here in the Philippines and its gonna cost me around 600 pesos( around $12-15 dollars without shipping) for both the base and halter in "standard quality" using PLA. what does it mean? and by the way is the 30% infill you mentioned the most suitable for this project? And should I just tell them to print "with 3 perimeters"?Im also assuming that they are able to have a 30% infill. Hy Danvir, the design has a tight fit, depending on the printers tolerance it may be necessary to grind some corners, i don`t know how exact those printers are, so its a try&error thing. Perimeters are the outlines of the part, 3 is better than two, and you have to ask them how much infill they are printing. i recently saw guy`s trying to delid the cpu with a clamp instead of a vice and with this destroying the tool, this is absolutley NOT recommended ! Hi! is there any adjustments to be made on the chopper base or halter? or are the measurements on the downloadable files the best ones to consider?" For enough strenght print at least with 3 perimeters and 30% infill " do they have default perimeters and infill? or arethe files valued at 30% infill? and i would like to know what "parameter" means here. Im really sorry, im a noob. i am planning to 3d print this thru a shop. i just dont wanna cause damage to processors and waste money reprinting this tool so i want to know. thanks. I saw that other tool too. it seems to not rely on the heatspreader notches. It might work with Ivy. I already contacted the guy who made it but I had no reply so far. I think that we will need another design with Ivy. Is there a consensus on the best type of vise for this? I recommend a long arm vise. Works great with Skylake i5-6600k. Won't work with IvyBridge i7-3770k. Tested with both CPUs. Unfortunately the IvyBridge heatspreader isn't exactly the same as the Skylake Heatspreader although they look similar. Page 126 of this PDF should hopefully help, I can't find any more detailed measurements for Ivy. Thanks for the Info Blunt, then i really need to find someone who will lend me a Ivy-Bridge to measure it out. Thank you for the work you put into this. Printed one last night on a Cubex Trio same neon orange PLA as shown in the video. Unfortunately it doesn't support Ivy Bridge. I have just tested a 3570S and it appears the sides of the IHS (the metal tabs) are longer than those on Haswell. Just a heads up. Colorfabb XT does not seem to work well. Stick with ABS or PLA. The Colorfabb tends to crack and deform rather than apply the pressure from the vise onto splitting the PCB from the core. I can provide images later on if anyone is interested. Also, just so that everyone knows, when trying to extract a stuck CPU, be careful not the scratch the core with a screwdriver when using something through the hole. Finally, when delidding, get a vise with a longer arm so that you can apply sufficient pressure. Lucky for me, I did not kill my CPU. @CrazyElf, i only print with ABS and PLA so you have to try out by your self. i printed mit at 200 micron layerhight, so anything smaller should also be fine, you just have to ensure that your x/y dimensions are set up good and the part will not end up beeing too small. Would Colorfabb XT with 50 microns work? @ Juan, 1155 CPUs should also work fine, as they share the same package size, the only thing on them is that there are cpus with the "sharp" top corner edges and some withe the "round" top corner edges, and i have no such round-corner cpu to do a test, so maybe it will work, maybe not. regading to the design guides from intel the, outer dimensions are the same.